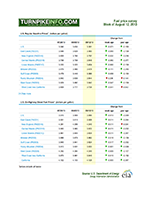 Gasoline prices continued their upward march as the summer driving season wound down with the Labor Day Holiday. The weekly gas price survey from the U.S. Energy Information Administration, the release of which was delayed this week because of the holiday, shows the average price of a gallon of unleaded gasoline in the U.S. has gone up another six-cents per gallon, setting over the $3.60 mark for the first time in several weeks. Prices have been under tremendous pressure as crude oil futures have skyrocketed in price lately, largely on fears of instability in the Middle East, particularly the situation in Syria. While gas price increase varied widely by region, most drivers from New York Metro to the Midwest paid between five and 10 cents per gallon more for gas during the past week, compared with the weeks immediately preceeding the Labor Day weekend. Drivers in New England and the West Coast states enjoyed lower price increases or, in the case of Washington and Oregon, price declines. Meanwhile, the price of diesel fuel has jumped considerably since last week, with some drivers paying about a penny per gallon more, as in the Rocky Mountain States, and truckers across the Midwest paying about a dime per gallon more for diesel. Despite the unreast overseas and fears of a possible colder-than-usual winter season ahead, fuel prices are down considerably from just a year ago. The U.S. average price for a gallon of regular gas is down nearly a quarter, while the price of diesel is about 15¢ per gallon less than at this time in 2012.